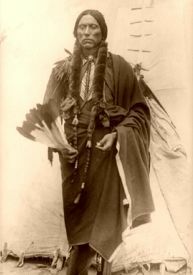 The last Chief of the Quahadi Comanche, Parker was both a major resistor to white settlers, as well as a leader in the tribe’s adjustment to reservation life. Quanah was born around 1845 to Chief Peta Nocona and Cynthia Ann Parker, a white captive of the Comanche, near the Wichita Mountains of Oklahoma. After 24 years of living with the Indians, Quanah’s mother was recaptured in the Battle of Pease River by Texas Rangers. After his wife’s recapture, Quanah’s father was a broken and bitter man and soon died. However, before his death, he told Quanah of his mother’s capture from the whites and with that, other tribesmen soon began to call him a half-breed and before long, the group split. Quanah joined the Destanyuka band of the Comanche, but later formed his own band called the Quahadi, which eventually grew to become one of the largest and most notorious Comanche bands on the Great Plains. When the Quahadis refused to sign the Medicine Lodge Treaty in 1867 they became fugitives, continuing their buffalo hunting way of life and sometimes raiding white settlements in the Texas Panhandle. In 1871 and 1872, several attempts were made by the Fourth United States Cavalry to subdue them, but failed. However, when numerous buffalo hunters began to invade their hunting grounds, Quanah, along with Comanche medicine man Isa-tai, sought to rid those who were decimating their chief source of survival and attacked their camp at Adobe Walls. 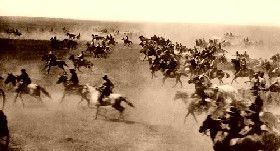 Though Quanah had recruited some 700 warriors from not only his own tribe, but also that of the Cheyenne, Arapaho and Kiowa, the attack on the Adobe Walls camp, occurring on June 27, 1874, was in vain. The buffalo camp, where only 28 men resided, fought off the Indians with their superior weapons and the warriors were forced to retreat. Quanah was wounded in what is referred to as The Second Battle of Adobe Walls and within a year, Parker and his band of Quahadis surrendered and moved to the Kiowa – Comanche reservation in southwestern Oklahoma. Though most of the Indians found the transition to reservation life extremely difficult, Quanah adapted so easily that he was soon made chief. For the next 25 years, he provided leadership — promoting self-sufficiency and self-reliance on the reservation — building schools, creating ranching operations, and planting crops. He also served as a judge on the tribal court and established the Comanche police force. Overall, he encouraged the tribe to learn the vast majority of the white man’s ways. However, he did not reject the Comanche traditions altogether, continuing to maintain five wives, refusing to cut his long braids, and rejecting Christianity. Through his own investments, he became a wealthy man, some say, the wealthiest Native American of the time. Though praised by many in his tribe, Quanah was also criticized for “selling out to the white man.” He also received rebuke because he was not elected Chief by the Comanche tribe, but rather, was appointed the role by federal agents. Because of this and the claim that Quanah was never given the title of chief before 1875, many assert that Chief Horseback is actually the last Comanche chief. Despite his efforts to protect the tribe and their reservation lands, in 1901, the U.S. Government voted to break up the Kiowa – Comanche reservation into individual holdings and open it to settlement by outsiders. Parker spent the rest of his life operating his profitable ranch. On February 23, 1911 he died of an undiagnosed illness. He is buried at Fort Sill, Oklahoma .